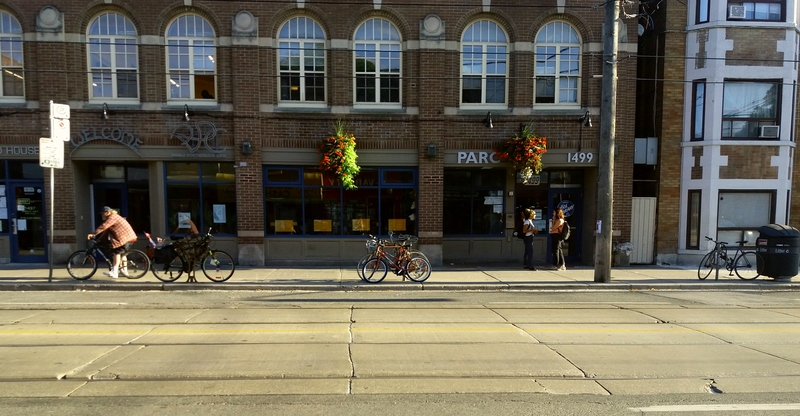 Parkdale case study in Toronto. A little bit of context. The City of Toronto is experiencing strong dynamics of socio-spatial polarization. Toronto sees the level of income segregation rise at a more rapid rate than elsewhere in Canada (Walks et al, 2016). Polarization patterns «spread incomes away from the middle and, spatially, polarization involved not only an increase in the income gap between neighbourhoods, but also the erosion of middle income neighbourhoods and their transformation into either a rich or a poor neighbourhood» (Ibidem, 2016, pp. 27). Parkdale is one of a few remaining downtown neighbourhoods in Toronto that are affordable and accessible to diverse community members: low-income people, marginalized populations with mental health and addiction experience, refugees and recent immigrants, people facing homelessness (PCED, 2016). Parkdale is a socially, culturally, and economically diverse neighbourhood. This diversity attracts a wide range of community members who choose to live, stay and socialize in Parkdale. The second value is affordability, which makes it possible for diverse community members – regardless of different socio-economic and cultural backgrounds – to call Parkdale their home. This combination of diversity and affordability creates a neighbourhood condition for the third value, inclusion. But this inclusivity is now at risk. Parkdale is a two-side neighborhood: North Parkdale has seen a growth of higher-income residents and strong gentrification processes occurred. In South Parkdale, where close to 35% of the population lives in poverty, gentrification processes are today strongly affecting the socio and spatial neighbourhoods patterns: lack of housing affordability and a rapid change of the commercial texture are signals of incoming gentrification in the South part of the neighbourhood. Census data confirm that there is a process of population change occurring in the neighbourhood. From 2005 to 2015 the Low Income Cut-off After-Tax (LICO-AT) decreased by 9.6% (Neighbourhood Change Research Partnership, 2018). In any case compared with 1970, North Parkdale became middle-income areas, while South Parkdale remained as low-income area. Two areas in South Parkdale became very low-income (ibidem, 2015). As the Parkdale Community Planning Study highlights, Gentrification in Parkdale should be considered in relation to the suburbanization of poverty. By 2012, as compared to 1970, more low-income and very-low income neighbourhoods had emerged in the city’s inner-suburbs (e.g. Scarborough and North York). Meanwhile, more high-income areas became concentrated in downtown and along subway lines. Equally important, it is striking that there were far fewer middle-income neighbourhoods. In short, Toronto has increasingly become a divided city (Hulchanski, 2009). Not only diversity, affordability, and inclusion are increasingly at risk also in South Parkdale, but also equitable outcomes of neighbourhood development and improvement. We should remember that Parkdale is one of the neighbourhoods included in the Neighbourhood Improvement Areas Strategy led by the City of Toronto with the aims to social sustain investment to address neighbourhood poverty concentration. Despite this, diverse community members raised a concern about losing local democratic control over how neighbourhood change has happened in Parkdale: land use decision-making is particularly market-driven (failure to prioritize community needs), compartmentalized (without coordination with other stakeholders and competing priorities) and privatized (lack of transparency and accountability) (PCED, 2016). Income threshold below which a family will likely devote a larger share of its income on the necessities of food, shelter and clothing than the average family. The approach is essentially to estimate an income threshold at which families are expected to spend 20 percentage points more than the average family on food, shelter and clothing. The TSNS 2020 «supports healthy communities across Toronto by partnering with residents, businesses and agencies to invest in people, services, programs and facilities in 31 specific neighbourhoods. This will strengthen the social, economic and physical conditions and deliver local impact for city-wide change». South Parkdale is considered one of the Neighbourhood Improvement Area within this strategy.